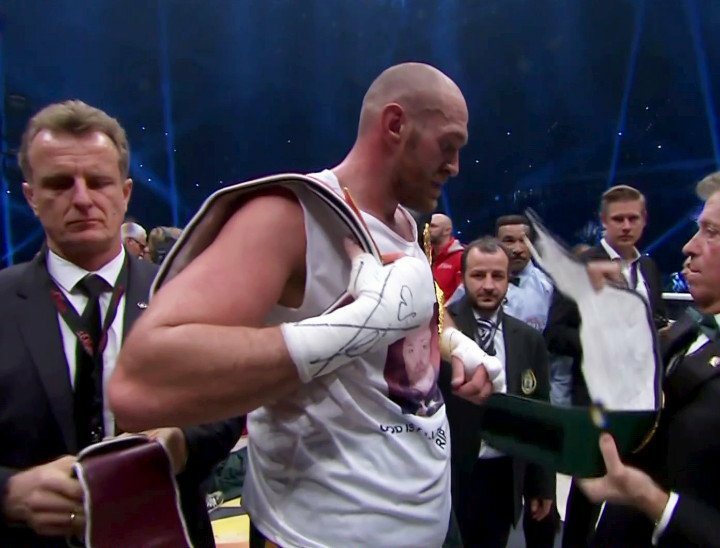 Though he has no next fight signed up as of yet, as he told Sky Sports on Saturday night in Manchester, heavyweight champion Tyson Fury is not at a loss when it comes to who he wants to fight next. Fury, again speaking with Sky Sports, says he wants to fight and defeat Wladimir Klitschko for a second time and then face and defeat Anthony Joshua. Putting it in his own colourful way, Fury says he will “bladder” both Klitschko and then Joshua. A Fury-Joshua fight would be a huge event in the UK, one that would likely sell out a big stadium. But Fury faces at least two hurdles before he can get that big money he referred to by fighting Joshua in a fight that would contest the IBF belt he briefly owned before being stripped for not defending it before he even had a chance to do so. Fury must first defeat Klitschko in the contracted return (we are still no closer to a date or a venue it seems) and then he would have to see if Joshua wanted to fight him in his first defence. Joshua, if he were to defeat Martin and win a slice of the heavyweight title, would have plenty of options for a voluntary defence. A.J could fight David Haye in an absolute blockbuster that has been talked about for some months now, Joshua could, if the first fight is exciting and memorable enough, fight Martin a second time, or Joshua could pick a nice “safe” opponent, one who is marketable enough by being a recognisable name, in his first defence. Joshua is taking a gamble by going for a major title after just 15 pro fights, but the real fun and games will come if he can win on April 9th. Fury, Haye and many other big names will all be aching to get their hands on him and the big money that will go along with a Joshua clash. Of course, the 2012 Olympic gold medallist could prove to be the biggest winner by beating Fury and/or Haye. How massive a star would Joshua become if that happened!